5 Lessons from 386,000,000 Emails: How Do You Stack Up Against Your Peers? What’s the best way to benchmark email performance? To have a true benchmark in the first place. Lucky you: we have that for you. Below is a recap of what we learned, kept fast and to the point — so you can act right now. Start seeing email opens to know when you’re top of mind. Lesson #1: People send an average of 23 emails per day. 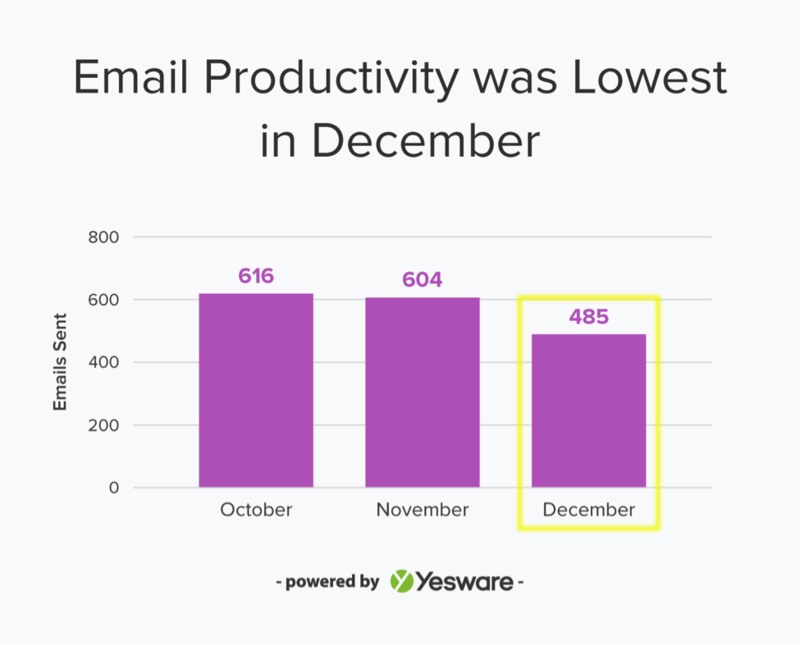 On average, Yesware users sent 1,384 emails across 3 months. That’s 61 weekdays (excluding weekends and holidays), or 23 emails per day. Reaching out to new recipients every day? Check out 9 formulas to get more replies. Lesson #2: If the Olympics included an emailing event, Nigeria would take home the gold. 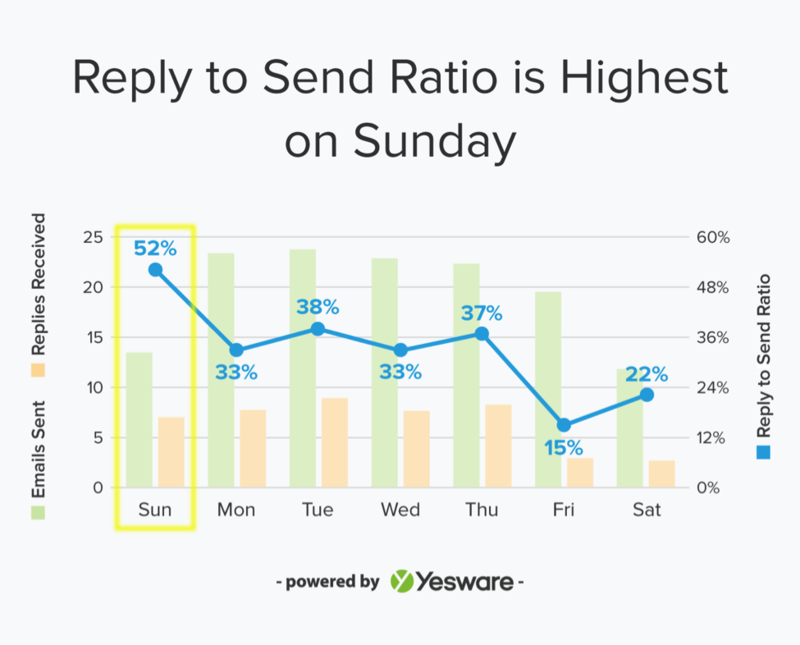 According to our analysis of over 300 million emails sent during the last three months of 2017, the average reply rate among Yesware customers worldwide is roughly 28%. 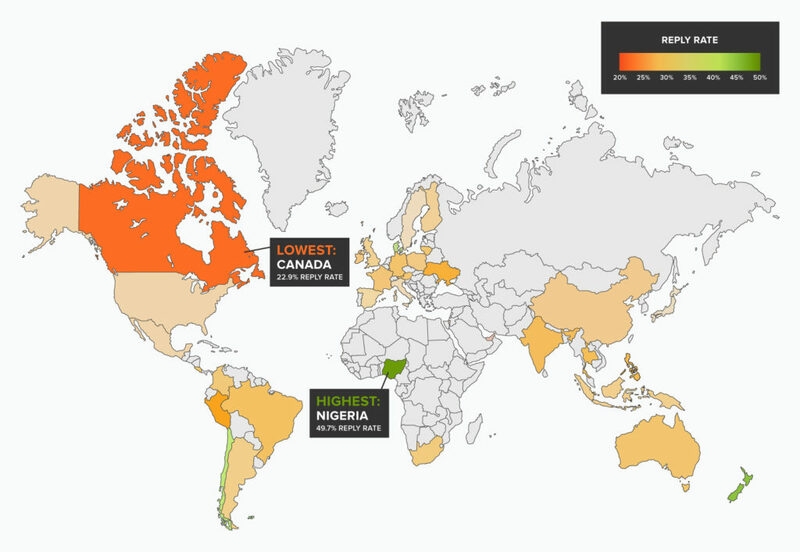 But that pales in comparison to the eye-popping 50% average response rate achieved by users in Nigeria. The African country ranked #1 for email effectiveness in our study, which measured average reply rates across the 40 countries with at least 100 Yesware users. Denmark. The bronze medalist with a 38% average reply rate and bragging rights as #1 in Europe. Mexico. With a 34.9% average reply rate, you beat the U.S. by a mere 0.2% to take top honors as the most effective emailers in all of North America. Bravo. Lesson #3: Average total email sends peaked on Election Day. It turns out November 7th was very busy for outgoing emails. So was November in general. Over half of the business days in November 2017 saw above average email sends. On top of that, 75 percent of Mondays and Tuesdays in November saw record high email sends for the last 3 months of 2017. Know when you’re most productive by tracking your own emails. Lesson #4: Sundays are a sweet spot for email replies. Our new research backs this. The closest to a 1:1 relationship where you receive one reply to every outgoing email you send is Sunday. The day with the lowest ratio is Friday. Research shows we only get 1 reply for every 7 emails we send on Fridays. The takeaway: Send your emails when competition is lowest. You can do it with a scheduling tool like Send Later. Lesson #5: On average, Yesware users saved up to 70 hours/month in 2017. One of our goals at Yesware is to save you time by replacing burdensome manual tasks with automation. So we invented tools like Templates to save time typing the same messaging over and over. And Campaigns to customize messaging and send it to multiple people at once. The average typing speed for a person is 35 words per minute. And the average email has 250 words. So, the time to compose one email is 250 / 35 = approximately 7 minutes, on average. From there, you multiply 7 minutes by your total sent emails to see how much time you saved by using automation. So, Templates and Campaigns saves Yesware users 7 minutes per email, on average. Your time saved = 7 * [( # Templates you inserted & sent) + (# campaigns you sent) * (your average # of recipients per campaign)]. On average, Yesware users sent 268 emails using Templates. They also sent 18 Campaigns with an average of 86 recipients per campaign. Average time saved = 7 * (268 + 86*18) = 12,712 total minutes → 212 total hours → 70 hours per month. Try Templates and Campaigns on your own — no credit card needed. Our data analysis looked at email send and reply events for October, November, and December of 2017. If you’re a Yesware user using a personal email address (see domains below), this includes all of your outgoing emails and replies. For other domains, we filtered our analysis to emails to and from recipients outside your email domain to exclude communication with your colleagues and focus on cold outreach. Out of all 386M emails analyzed, 160.1M were sent emails, and 226M were email replies received by Yesware users. Note: This analysis looks simply at the event itself and does not involve tracking on any part of your email content.